Even though the Cassini orbiter ended its mission on of September 15th, 2017, the data it gathered on Saturn and its largest moon, Titan, continues to astound and amaze. During the thirteen years that it spent orbiting Saturn and conducting flybys of its moons, the probe gathered a wealth of data on Titan’s atmosphere, surface, methane lakes, and rich organic environment that scientists continue to pore over. For instance, there is the matter of the mysterious “sand dunes” on Titan, which appear to be organic in nature and whose structure and origins remain have remained a mystery. To address these mysteries, a team of scientists from John Hopkins University (JHU) and the research company Nanomechanics recently conducted a study of Titan’s dunes and concluded that they likely formed in Titan’s equatorial regions. Their study, “Where does Titan Sand Come From: Insight from Mechanical Properties of Titan Sand Candidates“, recently appeared online and has been submitted to the Journal of Geophysical Research: Planets. The study was led by Xinting Yu, a graduate student with the Department of Earth and Planetary Sciences (EPS) at JHU, and included EPS Assistant Professors Sarah Horst (Yu’s advisor) Chao He, and Patricia McGuiggan, with support provided by Bryan Crawford of Nanomechanics Inc.
To break it down, Titan’s sand dunes were originally spotted by Cassini’s radar instruments in the Shangri-La region near the equator. The images the probe obtained showed long, linear dark streaks that looked like wind-swept dunes similar to those found on Earth. Since their discovery, scientists have theorized that they are comprised of grains of hydrocarbons that have settled on the surface from Titan’s atmosphere. “First, nobody expected to see any sand dunes on Titan before the Cassini-Huygens mission, because global circulation models predicted the wind speeds on Titan are too weak to blow the materials to form dunes. However, through Cassini we saw vast linear dune fields that covers almost 30% of the equatorial regions of Titan! To shed light on this, Yu and her colleagues conducted a series of experiments to simulate materials being transported on both terrestrial and icy bodies. This consisted of using several natural Earth sands, such as silicate beach sand, carbonate sand and white gyspum sand. To simulate the kinds materials found on Titan, they used laboratory-produced tholins, which are molecules of methane that have been subjected to UV radiation. The production of tholins was specifically conducted to recreate the kinds of organic aerosols and photochemistry conditions that are common on Titan. This was done using the Planetary HAZE Research (PHAZER) experimental system at Johns Hopkins University – for which the Principal Investigator is Sarah Horst. The last step consisted of using a nanoidentification technique (overseen by Bryan Crawford of Nanometrics Inc.) to study the mechanical properties of the simulated sands and tholins. In the end, the team determined that the organic molecules found on Titan are much softer and more brittle when compared to even the softest sands on Earth. Simply put, the tholins they produced did not appear to have the strength to travel the immense distance that lies between Titan’s northern methane lakes and the equatorial region. From this, they concluded that the organic sands on Titan are likely formed near where they are located. In the end, this study represents a new direction for researchers when it comes to the study of Titan and other bodies in the Solar System. As Yu explained, in the past, researchers were mostly constrained with Cassini data and modelling to answer questions about Titan’s sand dunes. However, Yu and her colleagues were able to use laboratory-produced analogs to address these questions, despite the fact that the Cassini mission is now at an end. “[O]ur results can not only help understand the origin of Titan’s dunes and sands, but also it will provide crucial information for potential future landing missions on Titan, such as Dragonfly (one of two finalists (out of twelve proposals) selected for further concept development by NASA’s New Frontiers program). The material properties of the organics on Titan can actually provide amazing clues to solve some of the mysteries on Titan. In the coming decade, multiple missions are expected to explore the moons of the outer Solar System and reveal things about their rich environments that could help shed light on the origins of life here on Earth. In addition, the James Webb Space Telescope (now expected to be deployed in 2021) will also use its advanced suit of instruments to study the planets of the Solar System in the hopes of address these burning questions. I think we were all blown away when the New Horizons spacecraft looked back at Pluto’s dark side and returned the first photos of a surprisingly complex, layered atmosphere. Colorless nitrogen along with a small percentage of methane make up Pluto’s air. Layers of haze are likely created when the two gases react in sunlight to form tiny, soot-like particles called tholins. These can ultimately grow large enough to settle toward the surface and coat and color Pluto’s icy exterior. 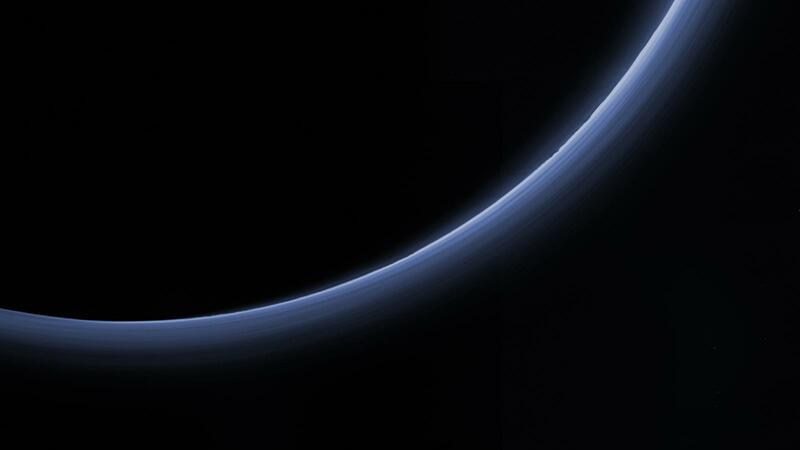 Now it seems Pluto’s atmosphere is capable of doing even more — making clouds! In an e-mail exchange with New Scientist, Lowell Observatory astronomer Will Grundy discusses the possibility that streaks and small condensations within the hazes might be individual clouds. Grundy also tracked a feature as it passed over different parts of the Plutonian landscape below, strongly suggesting a cloud. If confirmed, they’d be the first-ever clouds seen on the dwarf planet, and a sign this small 1,473-mile-wide (2,370 km) orb possesses an even more complex atmosphere than imagined. Given the onion-like layers of haze and potential clouds, perhaps we shouldn’t be surprise that it snows on Pluto. The New Horizons team announced the discovery this week of a chain of exotic snowcapped mountains stretching across the dark expanse of the informally named Cthulhu Regio. Cthulhu, pronounced kuh-THU-lu and named for a character in American horror writer H.P. Lovecraft’s books, stretches nearly halfway around Pluto’s equator, starting from the west of the vast nitrogen ice plain, Sputnik Planum. At 1,850 miles (3,000 km) long and 450 miles (750 km) wide, Cthulhu is a bit larger than the state of Alaska. But ever so much colder! Cthulhu’s red color probably comes from a covering of dark tholins formed when methane interacts with sunlight. But new close-up images reveal that the region’s highest mountains appear coated with a much brighter material. 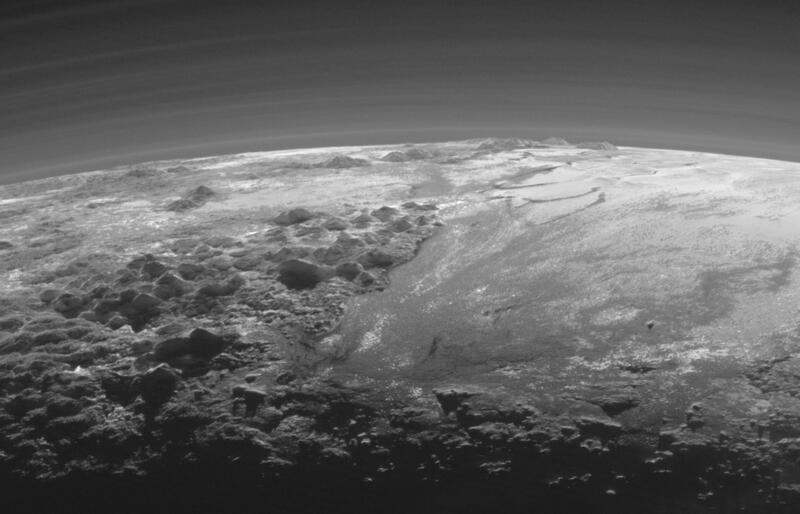 Scientists think it’s methane, condensed as ice onto the peaks from Pluto’s atmosphere. “That this material coats only the upper slopes of the peaks suggests methane ice may act like water in Earth’s atmosphere, condensing as frost at high altitude,” said John Stansberry, a New Horizons science team member. Compositional data from the New Horizon’s Ralph/Multispectral Visible Imaging Camera (MVIC), shown in the right panel in the image above, shows that the location of the bright ice on the mountain peaks correlates almost exactly with the distribution of methane ice, shown in false color as purple. New Horizons still has plenty of images stored on its hard drive, so we’re likely to see more clouds, frosty peaks and gosh-knows-what-else as the probe speeds ever deeper into space while returning daily postcards from its historic encounter. With each passing day, significant discoveries about Pluto continue piling up higher and higher as more and more data gathered and stored from this past summer’s historic flyby by NASA’s New Horizons reaches ground stations back here on Earth. “Blue skies–Pluto is awesome!” says Alan Stern, New Horizons principal investigator from Southwest Research Institute (SwRI), Boulder, Colorado. The bluish tint to Pluto’s skies were unexpectedly discovered after researchers examined the first color images of the high altitude atmospheric hazes returned by New Horizons last week that were taken by the probes Ralph/Multispectral Visible Imaging Camera (MVIC). “Who would have expected a blue sky in the Kuiper Belt?” Stern said in a NASA statement. Moreover, the source of Pluto’s blue haze is different from Earth’s and more related to Titan, Saturn’s largest moon – currently being explored by NASA’s Cassini mission orbiting Saturn since 2004. On Earth, the blue sky is caused by light scattering off tiny particles of nitrogen molecules. Whereas on Titan its related to soot-like particles called tholins. Tholins are generated by a series of very complex sunlight-initiated chemical reactions between nitrogen and methane (CH4) high in the atmosphere. This eventually produces relatively small, soot-like particles of complex hydrocarbons. “That striking blue tint tells us about the size and composition of the haze particles,” said New Horizons science team researcher Carly Howett, of SwRI, in a statement. As the tholins rain down on Pluto, they add to the widespread red surface coloring. The Ralph instrument was also key in another discovery announced by New Horizons researchers. 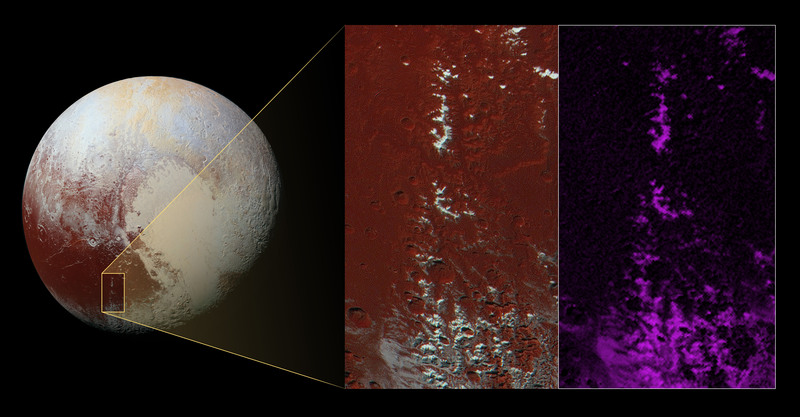 Numerous small, exposed regions of water ice on Pluto’s surface were discovered by combining measurements from the Ralph MVIC spectral composition mapper and infrared spectroscopy from the Linear Etalon Imaging Spectral Array (LEISA) instrument. The strongest signatures of water ice were found in the Virgil Fossa and Viking Terra regions berby the western edge of Pluto’s huge heart-shaped Tombaugh Regio feature – see image below. Water ice is only found in certain zones of Pluto for reasons yet to be understood. There may also be a relationship to the tholins, that likewise is yet to be gleaned. As of today, New Horizons remains healthy and is over 3.1 billion miles (5 billion kilometers) from Earth. The team hopes to fire up the thrusters later this fall to propel the spacecraft toward a second Kuiper Belt Object (KBO) in 2019 tentativley named PT1, for Potential Target 1. 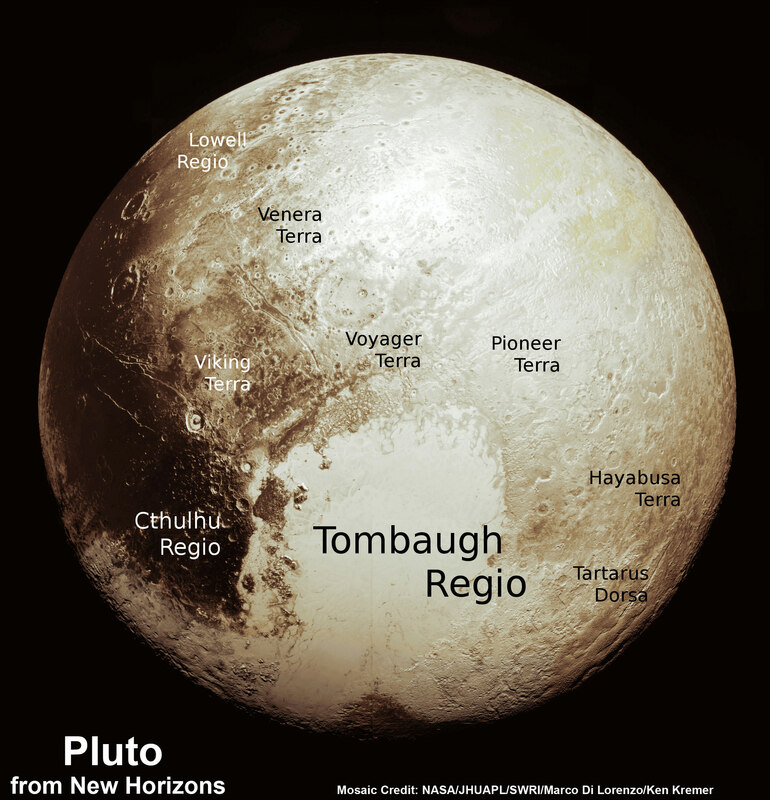 It is much smaller than Pluto and was recently selected based on images taken by NASA’s Hubble Space Telescope. As we await new imagery and data from the New Horizons’ flyby of the Pluto system to be transmitted to Earth, one piece of the Pluto-Charon puzzle that scientists are looking forward learning more about is the mysterious “dark pole” on Charon. Images sent immediately after the flyby reveal Charon’s north polar region is much darker than the lighter-colored material surrounding it, and it actually has a reddish cast to it. The New Horizons team says the red pole appears to be a thin deposit of dark material over a distinct, sharply bounded, angular feature – perhaps and impact basin – and scientists hope to learn more by studying higher-resolution images that are currently being beamed back to Earth from the spacecraft. Carly Howett, a senior research scientist at the Southwest Research Institute, is one of the scientists studying the mystery of what is causing this color difference and why it shows up at Charon’s north pole. It’s is so cold at Charon’s poles – temperatures there vary are just a tad warmer than absolute zero, between -433 and -351 °F (-258 and -213 °C) – that any gases settling there would freeze solid instead of escaping. And with the combination of extremely cold temperatures and solar radiation, the material is transformed to a new substance, and is being trapped on the pole. Howett said it likely won’t disappear with any seasonal changes on Charon. What is the new substance? Scientists can’t say for sure yet, but it might be a tholin. Scientists at Johns Hopkins University’s Hörst Laboratory have produced complex chemical compounds called tholins, which may give Pluto its reddish hue. (Image credit: Chao He, Xinting Yu, Sydney Riemer, and Sarah Hörst, Johns Hopkins University). What is a tholin? Tholins were first created in a laboratory by in the 1970s by Carl Sagan and his team at Cornell. According to planetary scientist Sarah Hörst, who wrote about tholins on The Planetary Society website, Sagan and his team would take mixtures of cosmically relevant gases and irradiate them with various energy sources. The result was “a brown, sometimes sticky, residue,” as Sagan described them in a paper he wrote in 1979. They came up with the name “tholin,” and theorized that tholins could be a constituent of the Earth’s primitive oceans and therefore as relevant to the origin of life. Finding out more about what is going on at Charon’s north pole is indeed intriguing. Tholins might be the same material that give Pluto its reddish-brown hue in some regions, too. Howett told Universe Today that the main instrument on New Horizons that will really pin down the compositional information is LEISA (Linear Etalon Imaging Spectral Array). For example, Howett said, maybe they’ll see more hydrogen cyanide (HCN) around the north pole region, which would open up a lot of complex chemistry options. “We will start getting this data down in the next few weeks, so hopefully we’ll have some answers soon!” she said. Neptune, that icy gas giant that is the eighth planet from our Sun, was discovered in 1846 by two astronomers – Urbain Le Verrier and Johann Galle. In keeping with the convention of planetary nomenclature, Neptune was named after the Roman god of the sea (the equivalent to the Greek Poseidon). And just seventeen days after it was discovered, astronomers began to notice that it too had a system of moons. Initially, only Triton – Neptune’s largest moon – could be observed. But by the mid-20th century and after, thanks to improvements in ground-based telescopes and the development of robotic space probes, many more moons would be discovered. Neptune now has 14 recognized satellites, and in honor of of their parent planet, all are named for minor water deities in Greek mythology. Triton, being the largest and most massive of Neptune’s moons, was the first to be discovered. It was observed by William Lassell on October 10th, 1846, just seventeen days after Neptune was discovered. It would be almost a century before any other moons would be discovered. The first was Nereid, Neptune’s second largest and most massive moon, which was discovered on May 1st, 1949, by Gerard P. Kuiper (for whom the Kuiper Belt is named) using photographic plates from the McDonald Observatory in Fort Davis, Texas. The third moon, later named Larissa, was first observed by Harold J. Reitsema, William B. Hubbard, Larry A. Lebofsky and David J. Tholen on May 24th, 1981. Hubble Space Telescope composite picture showing the location of a newly discovered moon, designated S/2004 N 1. Credit: NASA, ESA, and M. Showalter (SETI Institute). The discovery of this moon was purely fortuitous, and occurred as a result of the ongoing search for rings similar to those discovered around Uranus four years earlier. If rings were in fact present, the star’s luminosity would decrease slightly just before the planet’s closest approach. While observing a star’s close approach to Neptune, the star’s luminosity dipped, but only for several seconds. This indicated the presence of a moon rather than a ring. No further moons were found until Voyager 2 flew by Neptune in 1989. In the course of passing through the system, the space probe rediscovered Larissa and discovered five additional inner moons: Naiad, Thalassa, Despina, Galatea and Proteus. In 2001, two surveys using large ground-based telescopes – the Cerro Tololo Inter-American Observatory and the Canada-France-Hawaii telescopes – found five additional outer moons bringing the total to thirteen. Follow-up surveys by two teams in 2002 and 2003 respectively re-observed all five of these moons – which were Halimede, Sao, Psamathe, Laomedeia, and Neso. And then on July 15th, 2013, a team of astronomers led by Mark R. Showalter of the SETI Institute revealed that they had discovered a previously unknown fourteenth moon in images taken by the Hubble Space Telescope from 2004–2009. The as yet unnamed fourteenth moon, currently identified as S/2004 N 1, is thought to measure no more than 16–20 km in diameter. In keeping with astronomical convention, Neptune’s moons are all taken from Greek and Roman mythology. In this case, all are named for gods of the sea, or for the children of Poseidon (which include Triton, Proteus, Depsina and Thalassa), minor Greek water dieties (Naiad and Nereid) or Nereids , the water nymphs in Greek mythology (Halimede, Galatea, Neso, Sao, Laomedeia and Psamathe). However, many of the moons were not officially named until the 20th century. The name Triton, which was originally suggested by Camille Flammarion in his 1880 book Astronomie Populaire, but not into common usage until at least the 1930s. Neptune’s Regular Moons are those located closest to the planet and which follow circular prograde orbits that lie in the planet’s equatorial plane. They are, in order of distance from Neptune: Naiad (48,227 km), Thalassa (50,074 km), Despina (52,526 km), Galatea (61,953 km), Larissa (73,548 km), S/2004 N 1 (105,300 ± 50 km), and Proteus (117,646 km). All but the outer two are within Neptune-synchronous orbit (meaning that orbit Neptune slower than it’s orbital period (0.6713 days) and thus are being tidally decelerated. The inner moons are closely associated with Neptune’s narrow ring system. The two innermost satellites, Naiad and Thalassa, orbit between the Galle and LeVerrier rings, whereas Despina orbits just inside the LeVerrier ring. The next moon, Galatea, orbits just inside the most prominent Adams ring and its gravity helps maintaining the ring by containing its particles. Based on observational data and assumed densities, Naiad measures 96 × 60 × 52 km and weighs approximately 1.9 x 1017 kg. Meanwhile, Thalassa measures 108 x 100 × 52 km and weighs 3.5 x 1017 kg; Despina measures 180 x 148 x 128 and weighs 21 x 1017 kg; Galatea measures 204 x 184 x 144 and weighs 37.5 x 1017 kg; Larissa measures 216 x 204 x 168 and weighs 49.5 x 1017 kg; S/2004 N1 measures 16-20 km in diameter and weighs 0.5 ± 0.4 x 1017 kg; and Proteus measures 436 x 416 x 402 and weighs 50.35 x 1017 kg. Only the two largest regular moons have been imaged with a resolution sufficient to discern their shapes and surface features. Nevertheless, with the exception of Larissa and Proteus (which are largely rounded) all of Neptune’s inner moons are believed to be elongated in shape. In addition, all the inner moons dark objects, with geometric albedo ranging from 7 to 10%. Their spectra also indicated that they are made from water ice contaminated by some very dark material, probably organic compounds. In this respect, the inner Neptunian moons are similar to the inner moons of Uranus. Neptune’s irregular moons consist of the planet’s remaining satellites (including Triton). They generally follow inclined eccentric and often retrograde orbits far from Neptune; the only exception is Triton, which orbits close to the planet following a circular orbit, though retrograde and inclined. In order of their distance from the planet, the irregular moons are Triton, Nereid, Halimede, Sao, Laomedeia, Neso and Psamathe, a group that includes both prograde and retrograde objects. With the exception of Triton and Nereid, Neptune’s irregular moons are similar to those of other giant planets and are believed to have been gravitationally captured by Neptune. In terms of size and mass, the irregular moons are relatively consistent, ranging from approximately 40 km in diameter and 4 x 1016 kg in mass (Psamathe) to 62 km and 16 x 1016 kg for Halimede. Triton and Nereid are unusual irregular satellites and are thus treated separately from the other five irregular Neptunian moons. Between these two and the other irregular moons, four major differences have been noted. Triton is also one of the coldest moons in the Solar System, with surface temperature of about 38 K (?235.2 °C). However, owing to the moon being geologically active (which results in cryovolcanism) and surface temperature variations that cause sublimation, Triton is one of only two moons in the Solar System that has a substantial atmosphere. Much like it’s surface, this atmosphere is composed primarily of nitrogen with small amounts of methane and carbon monoxide, and with an estimated pressure of about 14 ?bar. Given the lopsided distribution of mass in its moons, it is widely believed that Triton was captured after the formation of Neptune’s original satellite system – much of which would have been destroyed in the process of capture. Many theories have been offered regarding the mechanisms of its capture over the years. The most widely-accepted is that Triton is a surviving member of a binary Kuiper Belt Object that was disrupted with an encounter with Neptune. In this scenario, Triton’s captured was the result of a three-body encounter, where it fell into a retrograde orbit while the other object was either destroyed or ejected in the process. Triton’s orbit upon capture would have been highly eccentric, and would have caused chaotic perturbations in the orbits of the original inner Neptunian satellites, causing them to collide and reduce to a disc of rubble. Only after Triton’s orbit became circular again could some of the rubble re-accrete into the present-day regular moons. 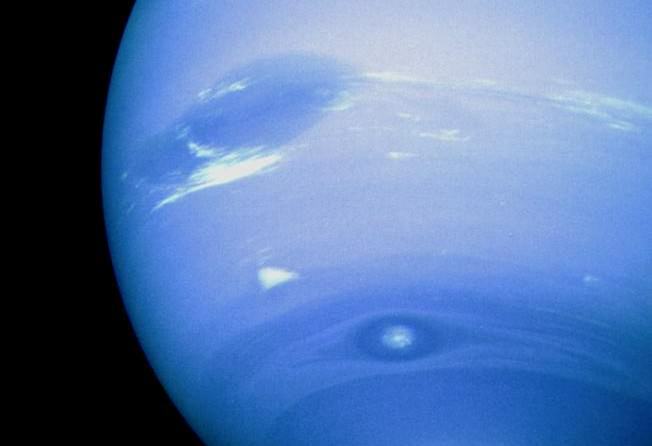 This means it is likely that Neptune’s present inner satellites are not the original bodies that formed with Neptune. Numerical simulations show that there is a 0.41 probability that the moon Halimede collided with Nereid at some time in the past. Although it is not known whether any collision has taken place, both moons appear to have similar (“grey”) colors, implying that Halimede could be a fragment of Nereid. Given its distance from the Sun, the only mission to ever study Neptune and its moons up close was the Voyager 2 mission. And though no missions are currently being planned, several proposals have been made that would see a robotic probe dispatched to the system sometime in the late 2020s or early 2030s. 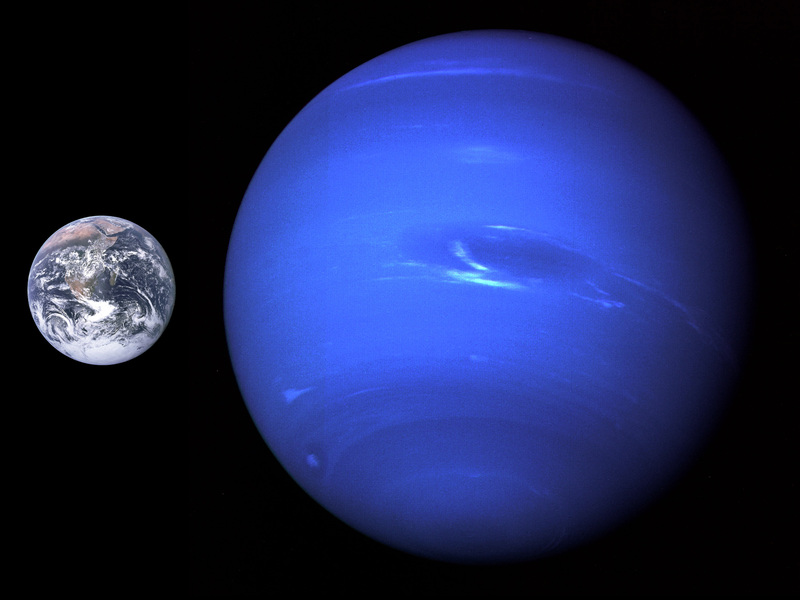 We have many interesting articles on Neptune, Neptune’s Moons, and the Trans-Neptunian region here at Universe Today. Here’s a full article about Neptune’s Moon Triton, Naiad and Nereid and S/2004 N 1. 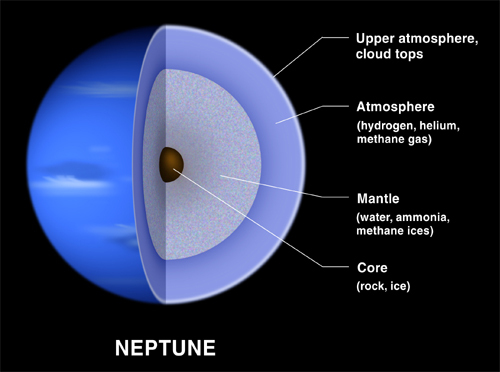 For more information, check out NASA’s Solar System Exploration page titled “Neptune: The Windiest Planet”. Over the course of the past decade, more and more objects have been discovered within the Trans-Neptunian region. With every new find, we have learned more about the history of our Solar System and the mysteries it holds. At the same time, these finds have forced astronomers to reexamine astronomical conventions that have been in place for decades. Consider 2007 OR10, a Trans-Neptunian Object (TNO) located within the scattered disc that at one time went by the nicknames of “the seventh dwarf” and “Snow White”. Approximately the same size as Haumea, it is believed to be a dwarf planet, and is currently the largest object in the Solar System that does not have a name. 2007 OR10 was discovered in 2007 by Meg Schwamb, a PhD candidate at Caltech and a graduate student of Michael Brown, while working out of the Palomar Observatory. The object was colloquially referred to as the “seventh dwarf” (from Snow White and the Seven Dwarfs) since it was the seventh object to be discovered by Brown’s team (after Quaoar in 2002, Sedna in 2003, Haumea and Orcus in 2004, and Makemake and Eris in 2005). At the time of its discovery, the object appeared to be very large and very white, which led to Brown giving it the other nickname of “Snow White”. However, subsequent observation has revealed that the planet is actually one of the reddest in the Kuiper Belt, comparable only to Haumea. As a result, the nickname was dropped and the object is still designated as 2007 OR10. The discovery of 2007 OR10 would not be formally announced until January 7th, 2009. A study published in 2011 by Brown – in collaboration with A.J. Burgasser (University of California San Diego) and W.C. Fraser (MIT) – 2007 OR10’s diameter was estimated to be between 1000-1500 km. These estimates were based on photometry data obtained in 2010 using the Magellan Baade Telescope at the Las Campanas Observatory in Chile, and from spectral data obtained by the Hubble Space Telescope. However, a survey conducted in 2012 by Pablo Santos Sanz et al. of the Trans-Neptunian region produced an estimate of 1280±210 km based on the object’s size, albedo, and thermal properties. Combined with its absolute magnitude and albedo, 2007 OR10 is the largest unnamed object and the fifth brightest TNO in the Solar System. No estimates of its mass have been made as of yet. 2007 OR10 also has a highly eccentric orbit (0.5058) with an inclination of 30.9376°. What this means is that at perihelion, it is roughly 33 AU (4.9 x 109 km/30.67 x 109 mi) from our Sun while at aphelion, it is as distant as 100.66 AU (1.5 x 1010 km/9.36 x 1010 mi). It also has an orbital period of 546.6 years, which means that the last time it was at perihelion was 1857 and it won’t reach aphelion until 2130. As such, it is currently the second-farthest known large body in the Solar System, and will be farther out than both Sedna and Eris by 2045. According to the spectral data obtained by Brown, Burgasser and Fraser, 2007 OR10 shows infrared signatures for both water ice and methane, which indicates that it is likely similar in composition to Quaoar. Concurrent with this, the reddish appearance of 2007 OR10 is believed to be due to presence of tholins in the surface ice, which are caused by the irradiation of methane by ultraviolet radiation. The presence of red methane frost on the surfaces of both 2007 OR10 and Quaoar is also seen as an indication of the possible existence of a tenuous methane atmosphere, which would slowly evaporate into space when the objects are closer to the Sun. Although 2007 OR10 comes closer to the Sun than Quaoar, and is thus warm enough that a methane atmosphere should evaporate, its larger mass makes retention of an atmosphere just possible. Also, the presence of water ice on the surface is believed to imply that the object underwent a brief period of cryovolcanism in its distant past. According to Brown, this period would have been responsible not only for water ice freezing on the surface, but for the creation of an atmosphere that included nitrogen and carbon monoxide. These would have been depleted rather quickly, and a tenuous atmosphere of methane would be all that remains today. However, more data is required before astronomers can say for sure whether or not 2007 OR10 has an atmosphere, a history of cryovolcanism, and what its interior looks like. Like other KBOs, it is possible that it is differentiated between a mantle of ices and a rocky core. Assuming that there is sufficient antifreeze, or due to the decay of radioactive elements, there may even be a liquid-water ocean at the core-mantle boundary. Though it is too difficult to resolve 2007 OR10’s size based on direct observation, based on calculations of 2007 OR10’s albedo and absolute magnitude, many astronomers believe it to be of sufficient size to have achieved hydrostatic equilibrium. As Brown stated in 2011, 2007 OR10 “must be a dwarf planet even if predominantly rocky”, which is based on a minimum possible diameter of 552 km and what is believed to be the conditions under which hydrostatic equilibrium occurs in cold icy-rock bodies. Currently, nothing is known of 2007 OR10’s mass, which is a major factor when determining if a body has achieved hydrostatic equilibrium. This is due in part to there being no known satellite(s) in orbit of the object, which in turn is a major factor in determining the mass of a system. Meanwhile, the IAU has not addressed the possibility of accepting additional dwarf planets since before the discovery of 2007 OR10 was announced. Alas, much remains to be learned about 2007 OR10. Much like it’s Trans-Neptunian neighbors and fellow KBOs, a lot will depend on future missions and observations being able to learn more about its size, mass, composition, and whether or not it has any satellites. However, given its extreme distance and fact that it is currently moving further and further away, opportunities to observe and explore it via flybys will be limited. However, if all goes well, this potential dwarf planet could be joining the ranks of such bodies as Pluto, Eris, Ceres, Haumea and Makemake in the not-too-distant future. And with luck, it will be given a name that actually sticks! We have many interesting articles on Dwarf Planets, the Kuiper Belt, and Plutoids here at Universe Today. Here’s Why Pluto is no longer a planet and how astronomers are predicting Two More Large Planets in the outer Solar System. Astronomy Cast also has an episode all about Dwarf Planets titled, Episode 194: Dwarf Planets. For more information, check out the NASA’s Solar System Overview: Dwarf Planets, and the Jet Propulsion Laboratory’s Small-Body Database, as well as Mike Browns Planets.